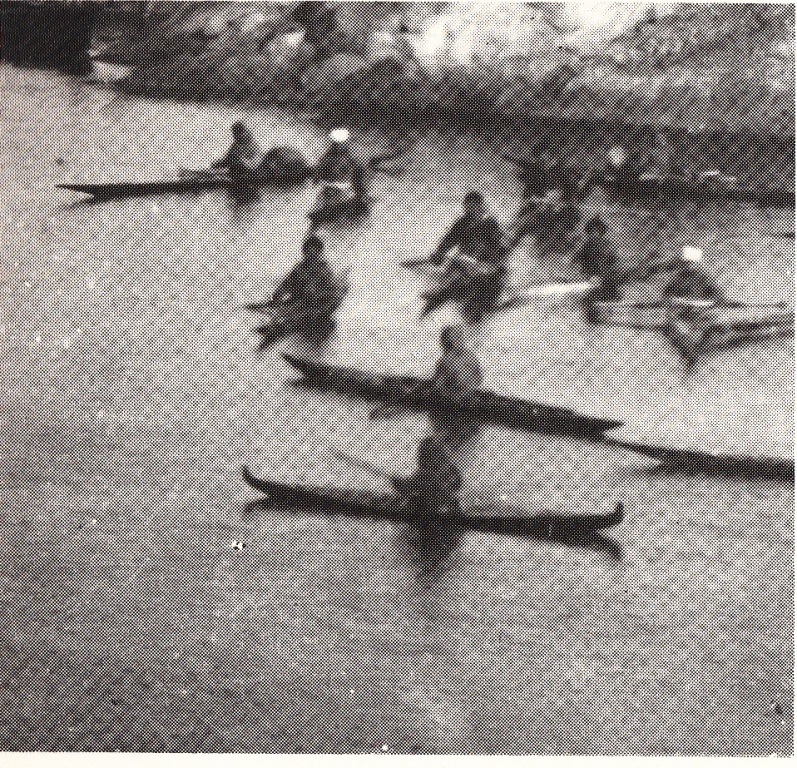 Kayaks in Greenland varied considerably by region, purpose, and era. The variety is so great, in fact, that referring to "a Greenland type kayak" in the singular, as if it constituted a consistent, known category, would be almost as meaningless as referring to an "American-type rowboat". 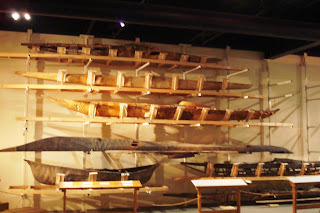 Old Greenland kayak, collected by Dutch whalers. Click any image to enlarge. 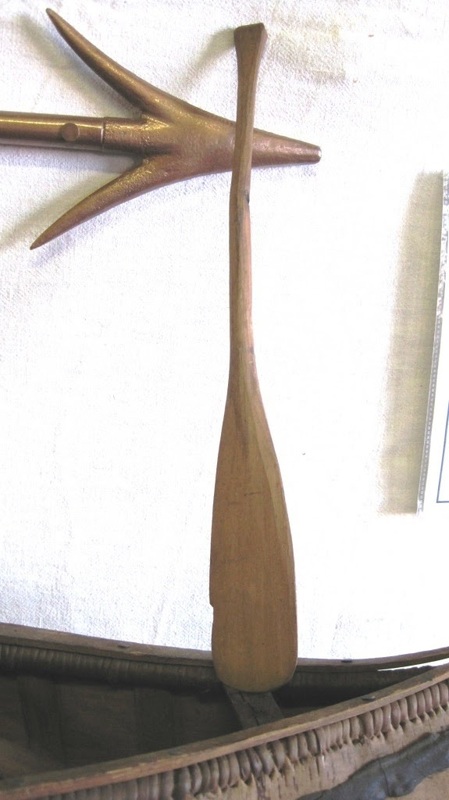 Dutch whalers were the first Europeans to encounter Greenland kayaks, in the mid-17th century. The kayaks they found there -- and they brought a few back to Holland as evidence -- were extraordinarily narrow and had extraordinarily high length-to-beam ratios. The average length was 565 cm (18'6"), and the average width 40.5 cm (only 16 inches -- yikes!). While such a calculation may not be statistically sound, if one uses the two average figures, the length/beam ratio works out to 13.95 to 1. Over the years, shorter and broader kayaks came into favor, and by the 20th century, the average figures were 515 cm (16' 10 3/4") long and 50.5 cm (20") wide -- still mighty narrow by the standards of modern recreational kayakers, but no longer a demanding balancing act in calm seas. One of the most common designs was the "flat" kayak, so-called because of its sheerline, which curved very gently. The ends do not turn up at all from the general line of the sheer. The foredeck has only a very slight curve athwartships, and the after deck is dead flat. This style is very shallow -- there is scarcely enough room for the paddler's legs under the foredeck and, with its small, round cockpit, entering the boat could be difficult. The bottom is also quite flat, both side-to-side and front-to-back. 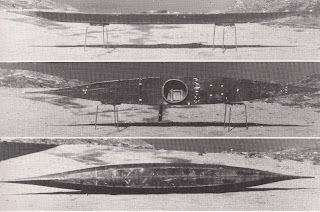 The deck of the "Dutch" kayak in the top photo is symmetrical fore-and-aft. 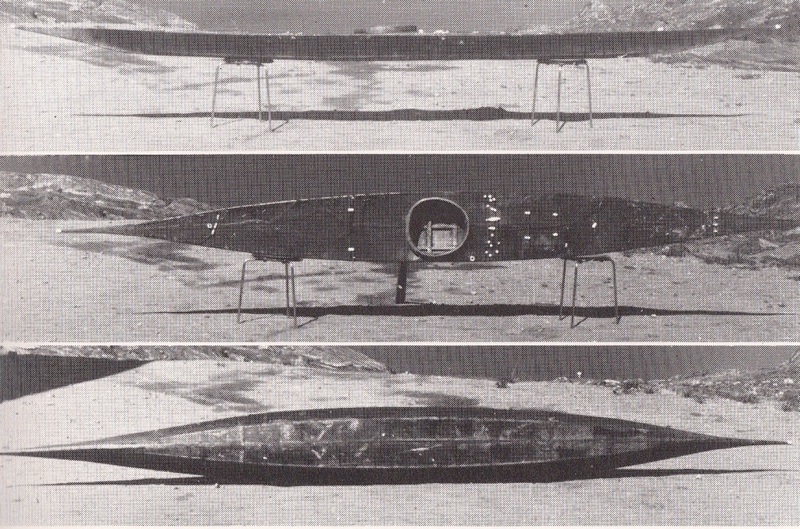 Compare to the "fish-form" shape of this "flat" kayak of southern Greenland, with its widest beam forward. The construction drawing above does not refer specifically to the flat kayak in the photo, which was built for a 14 year old boy. Dramatically different was the avasisaartoq type, with its substantial sheer and rocker and very high ends. Such a design has the advantage of greater maneuverability and potentially greater seaworthiness amidst steep seas in the hands of an expert paddler. But on the other hand, the high ends are a liability in high winds. The style was popular in the 19th century, but it faded out by the 20th, when kayak hunters began using rifles, because the high ends interfered with clear sighting-lines. 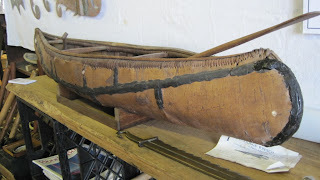 When Eskimos immigrated from Canada to northern Greenland around 1860, they brought with them the Thule type of kayak, with a high bow, low afterdeck with a very slight upturned end, and maximum beam aft of the cockpit. One more interesting type is a cult kayak known as the piaaqqisiaq. Distinguished by sharp upturns at the very ends, it existed for reasons of belief rather than pragmatism. 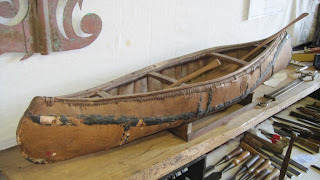 A man whose first son had died in infancy was supposed to build a kayak of this type for his other sons when they grew old enough to have their first kayak. ﻿Boys who did not have a dead older brother were given conventional kayaks, and that boys who did grow up with the piaaqqisiaq got a standard kayak when they attained the age of a hunter. [Content, including art, for this post are mostly from H. C. Peterson Skinboats of Greenland (Ships and Boats of the North) ]. 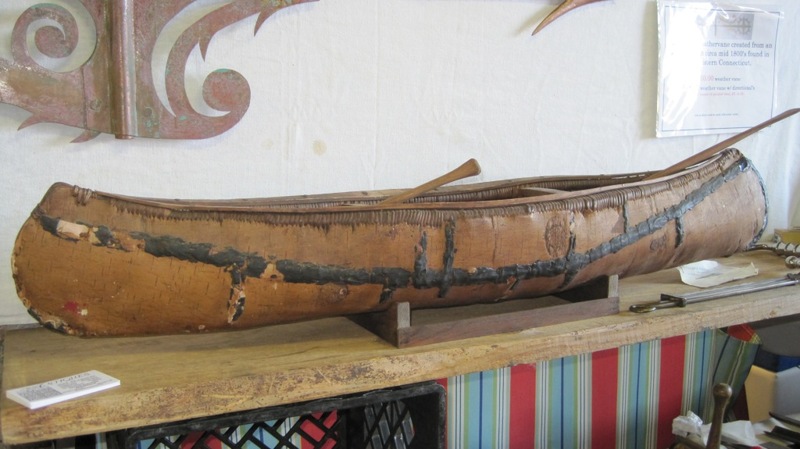 This four-foot long model, by Burt Libby, was on display in the booth of Kimball Pond Boat Barn, the only canoe exhibitor at the Pinetree State Sportsman Show. Burt is a well-known builder of full-size cedar-canvas canoes, and this model shows excellent craftsmanship and close adherence to scale in most respects. 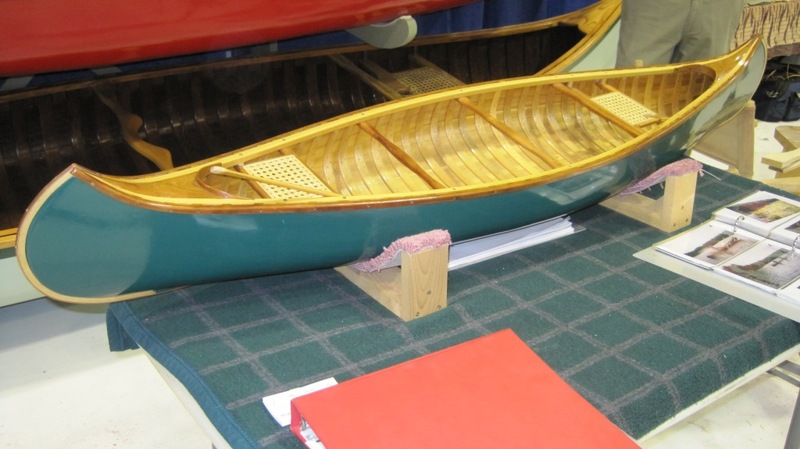 Not for sale, the model was an attention-getter for the Northeast (i.e., Maine) chapter of the Wooden Canoe Heritage Association, which Kimball Pond owner Bob Bassett was making room for in his booth. Kimball Pond Boat Barn is a builder and restorer of small boats, primarily cedar-canvas canoes. 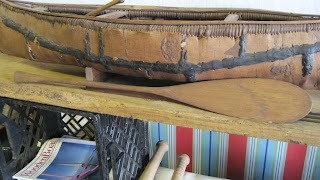 This bark canoe model with two paddles was on sale at the Maine Boatbuilder Show by Jeff Pearson Antiques. I didn't have a chance to learn much about it, but a booth attendant thought it represented a Malecite style canoe. Price was thought to be around $1200. I don't know if that's accurate, nor if it's reasonable, but it does have a nice aura of authenticity. The longer of the two paddles was in better condition. The shorter paddle had a bad crook in the shaft and a big chip out of the blade. 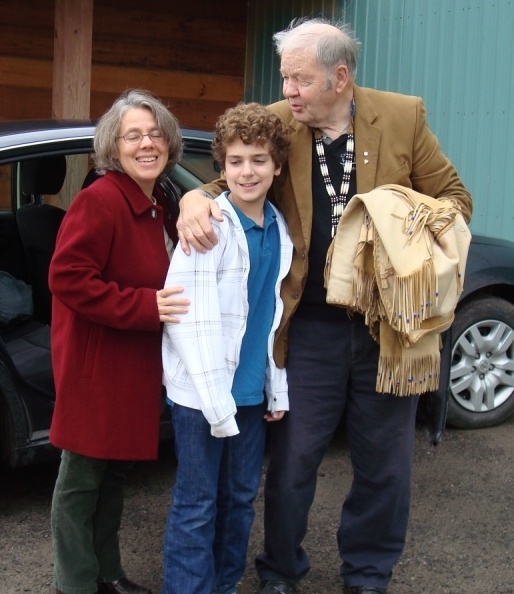 Sad news: Kirk Wipper, founder of the Canadian Canoe Museum, died on Friday. He was 88 years old. A nice obituary and capsule biography is here. ﻿﻿Kirk played an immeasurably important role it the preservation of the history of the canoe, Canadian and otherwise, and he was considered a heritage hero in Canada. Just yesterday, before I learned of his death, he came up in a conversation at the Pine Tree State Sportsman's Show in Winslow, Maine. Bob Bassett, owner of Kimball Pond Boat Barn was there displaying his wares, and he generously devotes part of his booth to promoting the Northeast (i.e., Maine) Chapter of the Wooden Canoe Heritage Association, of which chapter he serves as president. I was there helping Bob on the WCHA end of things, as so was Benson Gray, a direct descendant of the Grays who owned and ran Old Town Canoes for generations. Benson is an authority on the history of Old Town and immensely knowledgeable about cedar-canvas canoe history in general. 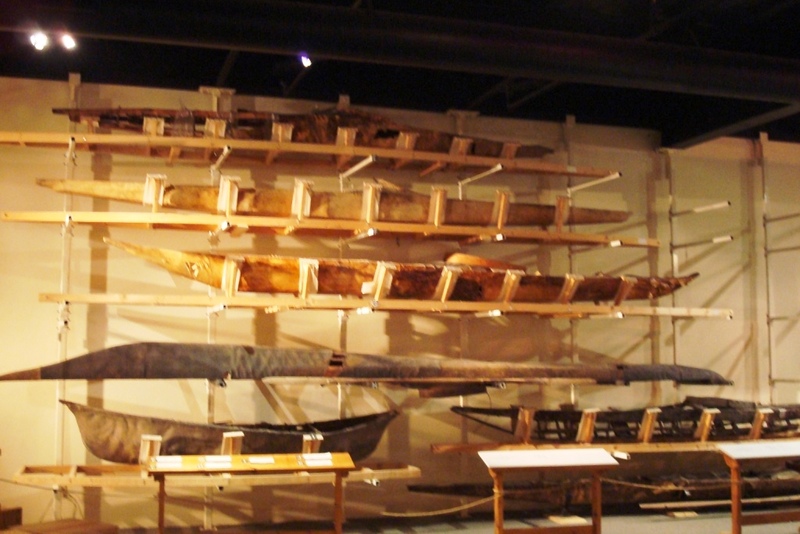 Kayaks and other skin-on-frame boats at the Canadian Canoe Museum. One of these may have been the subject of Benson Gray's story. ﻿﻿﻿ ﻿﻿ According to Benson, the Canadian Canoe Museum (CCM) had acquired a historically significant Inuit kayak whose cover was in poor condition and in need of conservation. After some searching, Kirk and others of the CCM found some of the very last Inuit women with experience at sewing kayak covers from sea-mammal skins, and transported them at great expense from their home in the Far North to the museum in Peterborough to have them make repairs to the kayak's cover. These women examined the canoe and said that the cover could not be repaired: it must be replaced. 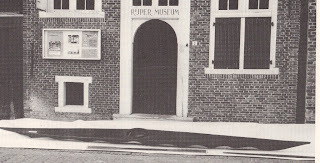 Museum personnel tried to explain the conservation objective of the project, and the women tried to explain that the existing cover was no good. 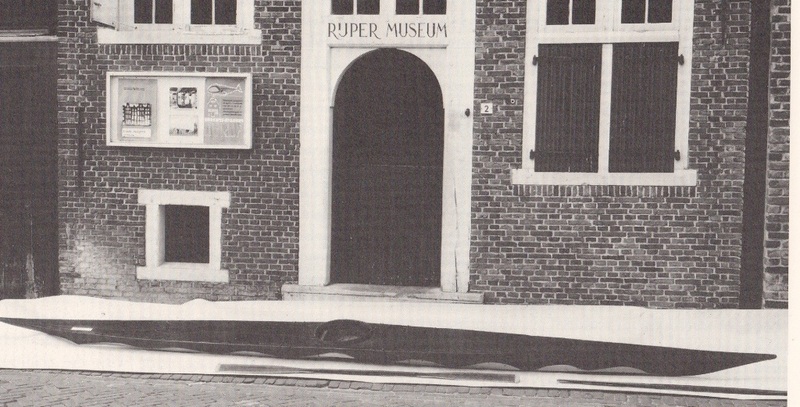 Neither convinced the other, but the women won, because they refused to do a job that they considered useless, and the museum had to return them to their homes with the job undone. I met Kirk at the Maine Canoe Symposium, and found him to be easy-going and somewhat of a kidder. It took me a while to learn that he was a dedicated humanitarian and a historian, capable of great humility, sensitivity, dedication and kindness. In November, 2009, I visited the CCM with my wife and son, and we had the honor of being shown around the museum (including its spectacular storage areas) by Kirk. With all his accomplishment and esteem, he was extraordinarily open, approachable, and generous, and it's an experience I'll long remember. A dugout canoe estimated at 1,100 years old was recently excavated on Weedon Island, near St. Petersburg, Florida. 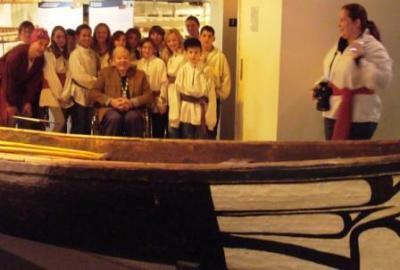 At 40 feet long and reasonably complete, the canoe is a remnant of the Manasota culture. The Manasota were indigenous to Florida's west coast from about 550 BC to 900 AD, according to this report in the UK's Daily Mail. Discovered about ten years ago, excavation did not occur until recently, after the development of a proper plan for preservation and the necessary fundraising. After about two years of preservation efforts, the canoe is expected to go on display at the Weedon Island Preserve Cultural and Natural History Center. Watch the cheesy local news report. Thanks to friend Tom Rankin for this news item.